Buttigieg thinks he has chops to take on Trump. Ascending to the Oval Office is a “seismic jump” for senators and governors and national figures, says the 37-year-old mayor of South Bend, Indiana, who is in Iowa mulling his own bid for the presidency and making a case for generational change and practical leadership. “I think the mayor of a city any size has the kind of on-the-ground, front-line, problem-solving executive experience whose absence is on display right now in Washington,” Mayor Pete Buttigieg said in an interview with this newspaper in the lobby of the Downtown Des Moines Marriott. 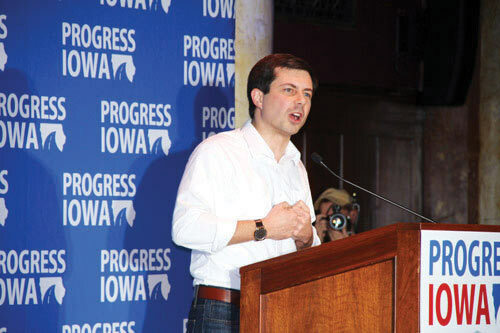 Buttigieg, who governs a city of 102,000, the home to Notre Dame University, campaigned recently in Ames, Grinnell, Ankeny and Johnston. He spent time at the Marriott in Des Moines, where CITYVIEW interviewed him as he ate a cheeseburger and fries in the lobby bar. “The biggest thing we’ve got to work on is our democracy itself,” Buttigieg said. In Emerson’s second poll of the Iowa caucuses, released in late March, former Vice President Joe Biden narrowly leads the Democratic field with 25 percent, followed by Vermont Senator Bernie Sanders at 24 percent. Buttigieg has surged to 11 percent. Senator Kamala Harris of California follows with 10 percent — the only other candidate to clear double digits in Iowa, according to Emerson. “Mayor Pete,” as he is known on the campaign trail these days, is not the only current or former Democratic mayor eyeing the White House. New York City Mayor Bill de Blasio and former New York City Mayor Michael Bloomberg (who says he’s not running) both have traveled to Iowa in the last year, as has Los Angeles Mayor Eric Garcetti. New Orleans Mayor Mitch Landrieu is widely considered another potential Democratic presidential contender. Senior members of the U.S. House and Senate often have never managed more than 100 people in their lives, Buttigieg said in making the case for mayors. Buttigieg, elected at age 29 as mayor, said he has more years of experience in government than President Donald Trump. “I actually believe experience is an important part of the equation,” Buttigieg said. Buttigieg said being mayor of a mid-sized city means he’s more involved directly in the day-to-day operations of his city than his peers in large cities. According to his website, Buttigieg, a Rhodes Scholar, studied philosophy, politics and economics at Oxford and holds a bachelor’s degree in history and literature from Harvard, where he graduated Phi Beta Kappa. Buttigieg was born in South Bend. A former officer in the Naval Reserves, Buttigieg served in Afghanistan. He notes that he would have the most military experience of any president since George H.W. Bush. “Somebody who has had that war-time experience maybe has a little more credibility in pointing out that we have to end endless war,” Buttigieg said. He said one the reasons his campaign resonates is a generational appetite and energy for change and youth. Senior citizens were a big part of his mayoral races, he said. Buttigieg would be the first openly gay candidate for a major party were he to earn the Democratic nomination in the coming two years. His husband, Chasten, is a junior high school teacher who has traveled with Buttigieg to Iowa, including on the most recent trip. Buttigieg said he understands the barrier-breaking aspect of his candidacy but quickly added that his youth, policy ideas and military background are the more interesting features of his public life. For now, Buttigieg is not an official candidate. He’s in the toe-in-the-water stages in Iowa with the formation of an exploratory committee. He wants to gauge response from voters and see whether he can put an effective organizational team together. “I feel very good about the trajectory,” he said. If he formally enters the race, Buttigieg said voters can expect to see him in small towns in Iowa. If rural areas are abandoned to the Republicans, then it becomes a self-fulfilling prophecy, he said. Buttigieg said he thinks his home, the industrial Midwest, is the center of gravity in politics, giving a candidate from that region an advantage in the general election. Candidate could debut the technology as early as June. Artwork by Meriah Blakley, Roo Bea Design Co., Denison, Iowa. Democrat Andrew Yang, best known for advocating a universal basic income ($1,000 a month for all adults, no questions asked), plans to make appearances as a lifelike hologram, with a 3D dynamic image of a himself beamed remotely to, say, the flatbed of a truck for some campaign events and gatherings, a bold use of new technology to drive home his increasingly popular narrative about the collapse of the old American economy for millions of vulnerable workers. In a phone interview with CITYVIEW a few days ago, Yang said his campaign is working with a hologram company and could debut the technology — possibly in Iowa — as early as June. “I thought it would be a fun way to be in multiple places at once, and also very much tied into the message of the campaign around the fact that it is 2019 and soon it will be 2020 and things are changing, and we can’t just keep doing the same things over and over again and expect it to achieve the results we need,” Yang said. Yang said he will continue to aggressively schedule in-person stops (such as a planned swing through Iowa in late April), but he thinks the hologram will add exposure and excitement to his campaign.